Most U.S. equities finished up from the lows of the day as investors reassessed the strongest first-quarter rally in almost a decade. Treasuries resumed their push higher, while the pound fluctuated after Theresa May announced a proposal to break the logjam over Brexit. The Dow was dragged down for the first time in four days by Walgreens Boots Alliance Inc. after lower pharmacy reimbrusements hurt earnings at the drugstore chain. Technology shares pushed the Nasdaq higher. After being lower most of the session, the S&P 500 finished little changed. Carmakers pushed the Stoxx Europe 600 Index to the highest close this year. Asia’s benchmark finished broadly unchanged as Japanese shares slipped and stocks in Shanghai and Seoul advanced. “The world is cautiously optimistic -- hoping for the best, but preparing for the worst,” said Jay Pestrichelli, founder and chief executive of ZEGA Financial, which manages around $400 million. 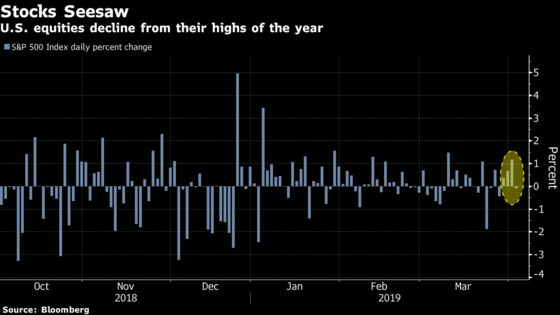 Positive sentiment in the first quarter has spilled over into the second, and global equities began this week building on the best start to a year since 2010 as traders bet on looser monetary policy. Still, a myriad of risks remain, including Europe’s slowing growth, Britain’s difficult split with the European Union and the lingering trade war. U.S.-China talks are set to resume when Vice Premier Liu He leads a delegation to Washington later this week. Elsewhere, oil traded near a four-month high in New York as a further retreat in OPEC’s production signaled that global markets are tightening. OPEC crude production fell for a fourth month in March as Saudi Arabia forged ahead with cutbacks and as power blackouts in Venezuela further squeezed supplies, a Bloomberg survey showed on Monday. Bitcoin jumped as much as 23 percent to its highest level since late November, according to Bloomberg composite pricing. Chinese Vice Premier Liu He leads a delegation of trade negotiators to Washington on Wednesday. The S&P 500 Index was little changed at 2,867.28 as of 4:01 p.m. New York time, while the Nasdaq Composite Index gained 0.3 percent and the Dow Jones Industrial Average dropped 0.3 percent. The Stoxx Europe 600 rose 0.4 percent, the third consecutive gain. The MSCI Emerging Market Index rose 0.1 percent, the fourth straight daily increase. The Bloomberg Dollar Spot Index gained 0.2 percent. The euro eased 0.1 percent to $1.1198, while the yen weakened less than 0.1 percent to 111.38 per dollar. The British pound rose less than 0.2 percent to $1.3124. The MSCI Emerging Markets Currency Index eased less than 0.1 percent. The yield on 10-year Treasuries declined three basis points to 2.48 percent. Germany’s 10-year yield fell two basis points to negative 0.05 percent. Britain’s 10-year yield fell four basis points to 1 percent. West Texas Intermediate rose 1.7 percent to $62.66 a barrel, touching the highest level since November. Gold advanced 0.3 percent to $1,291 an ounce. The Bloomberg Commodity Index rose 0.2 percent, the second consecutive gain.